Waianae pitcher Darius Fuller struck out 11 Radford batters yesterday in a 6-0 win on the road. A good team can manufacture runs and win in a variety of ways. A great team can do that and ride the arm of a dominant pitcher. For now, the Waianae Seariders are coasting toward greatness. Senior ace Darius Fuller struck out 11 and walked none as third-ranked Waianae stifled Radford 6-0 yesterday. The Seariders improved to 6-1 in Oahu Interscholastic Association West play (10-5 overall). Despite wet, gusty conditions at Radford's Daniel Morita Field, Fuller was on top of his game. The 5-foot-8 multi-sport standout had total command of his fastball, slider and curveball. "I haven't been at my best yet, but yeah, I was in a zone," said Fuller, who had two quick strikeouts in the opening inning and stayed on point. His longtime catcher, Ande Kuakini, made most of the pitch calls. "He was hitting his locations. It looked like he was throwing harder today. After school, he was already pumped," Kuakini said. "His slider was on. It starts off high and the thing just drops." Longtime coach Kekoa Kaluhiokalani praised Fuller for his third win in as many decisions. "I've had (Fuller) since his sophomore year. His competitiveness is his strength," Kaluhiokalani said. "He goes after hitters. His mind won't let him fail." Radford slipped to 3-3 in league play despite a solid effort from ace Michael Goodman. The 6-foot-5, 270-pound senior fanned nine Seariders and walked just one. 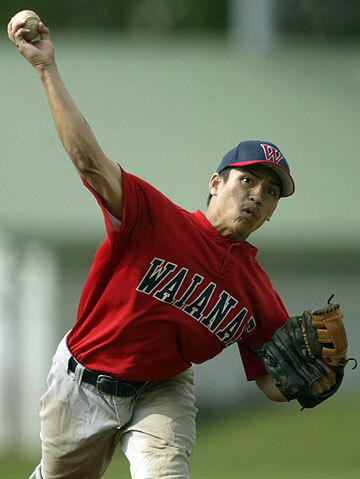 Waianae, however, punished Goodman when his fastball got away. Barak Holt, who finished 2-for-4, singled and came home on a pair of Radford errors in the first inning. Goodman's pickoff attempt got away from first baseman Danny Gammons. On the same play, right fielder Travis Sullivan's throw went awry, allowing Holt to score. Fuller singled in the third and came home on Holt's triple to left. Holt scored on Kuakini's sacrifice fly to center, giving Waianae a 3-0 lead. Nathan Malaki gave Waianae an insurance run in the fifth. After reaching base on an infield single, he went to second base on a balk and reached third on a wild pitch. Fuller's groundout to second brought Malaki in for a 4-0 Waianae lead. Darius Fuller and Ande Kuakini. Michael Goodman and Chris Stutz. W--Fuller. L--Goodman. Leading hitters--Wain: Fuller 2-4, 2 RBIs; Barak Holt 2-4, 3b, 2 RBIs; Ben McQuown 2-2, 3b. Rad: Goodman 2-3. Bash Locquiao and Kevin Newcomb combined for a three-hitter to lead the Sabers in a shutout win against the Bulldogs. Catcher Kendall Kydson had three hits and drove in four runs for Campbell, while Camcion Howser added four hits, including a pair of doubles. Bash Locquiao, Kevin Newcomb (4) and Kendall Kydson, Miles Tynanes (4). Bryce Whittaker, Joshua Whittaker (1), Derrick Nacario (3) and Justin Mangallan, Jacob Valmoja (4). W--Locquiao. L--B. Whittaker. Leading hitters--Camp: Kydson 3-3, 4 RBIs; Camcion Howser 4-4, 2 2b's; Isaiah Kaaihue 2-3; Zach Sistoza 2-2, 2 RBIs. Kaimi Haina scored the eventual game-winning run in the bottom of the fifth inning and also earned the save after pitching out of a bases-loaded jam in the top of the seventh to give the Marauders the victory. Calvin Gipson, Jon Santiago (4) and Trenton Nakata. Alfred Naglangit, Michael Gonzalez (4), Kaimi Haina (7) and Jake Tabieros. W--Gonzalez. L--Santiago. S--Haina. Leading hitters--Kapo: Nakata 2-4; Gipson 1-2, HR, 2 RBIs; Mark Paperelli1-3, 2b, 2 RBIs. Waip: Derek Kiyabu 2-4, 2b; Gonzalez 2b, RBI; Lance Loa 2 RBIs. Bryce Rivera and Brandon Akiyoshi combined for a two-hit shutout with seven strikeouts in the Trojan victory over the Golden Hawks. Bryce Rivera, Brandon Akiyoshi (4) and Blayne Kamahiai. Lansen Koko, Aino Oliveira (5) and Curtis Wright. W--Rivera. L--Koko. Leading hitters--Mili: Dustin Antolin 2-3, 2 2b; Jordan Apduhan 2-2, 2b; Ryne Miyamoto 2-2, 3 RBIs; Travis Jones 2-2, 2 2b, 4 RBIs; John Abreu 2-2; Tojo Ishida 2b; Brandon Akiyoshi 2-2, 3b, 3 RBIs. The game will be made up on Monday at 4 p.m. at Leilehua. Russell Sasaki gave up just one earned run for the Cougars, who prevailed by six runs despite getting outhit by the Surfriders 11-10. Mike D'Allesio, Patrick Murphy (1), Kili Vierra (5) and Rayner Yokoi, D'Allesio (1), Yokoi (5). Russell Sasaki and Jarryd Maeda. W--Sasaki. L--D'Allesio. Leading hitters--Kail: Zach Akamine 2-3; Aaron Kunioka 2-4; Kainoa Uemoto 2-4, 2b, 2 RBIs; Kurt Sasaoka HR. Kais: Colby Ho 2 2b, 2 RBIs; Nanea Baird 2-3, 2b; Kahanu Chan 2-4; Andy Uehara 2-5; Alex Talavera 2 RBIs. The Menehunes trailed by a run going into the sixth inning, but John Estores drove in Jordan Monico for the go-ahead run, and Moanalua exploded for eight runs in the inning. Kekoa Lee, Michael Amorozo (3) and Wade Iwanaga. Ryan Goto, Jefferson Okada (5), Devin Okinaga (6) and Andrew Mitani. W--Amorozo. L--Okada. Leading hitters--Moan: Jordan Monico 2-5, 2 2bs; Markus Miyashiro 2-4, 2 2b; John Estores 2-2, 2b; Jared Coloma 3b. McK: Mitani 2-2, 2b; Okinaga 2-4, 3b; Goto HR. Nick Wong tossed a three-hit shutout, striking out eight and walking just one, as the Rough Riders blanked the Red Raiders. Leading hitters--Roos: Dane Kinoshita HR; Kila Delovio 2-3; Keoni Manago 2b. The game will be made up today at Castle at 4 p.m. The defending-state-champion Buffanblu won behind eight runs on seven hits, thanks in part to 11 walks given up by Raider pitchers. Steve Dannaway had a double and drove in three runs for Punahou. Jeeter Ishida, Scott Hiramoto (7) and Zachary Kometani. Wally Marciel, Jon Okada (6), Reyn Nagamine (6), Kelsey Outram (7) and Jarvis Nohara. W--Ishida. L--Marciel. Leading hitters--Pun: Matt Suiter 2b; Steve Dannaway 2-2, 2b, 3 RBIs. Iol: Travis Nishida 2-4, HR, 2 RBIs; Nohara 2-2; Marciel 3-4; Brett Hasegawa 2-4.